I’m a little late to the slime trend. I avoided it for so long because one it’s messy and quite honestly…. with 5 kids, I just don’t enjoy more mess. (I’m not one of those moms. I send my kids to Grandma’s house for the messy crafts). The other reason I steered clear of homemade slime is because it always contained ingredients that were not natural enough for me. 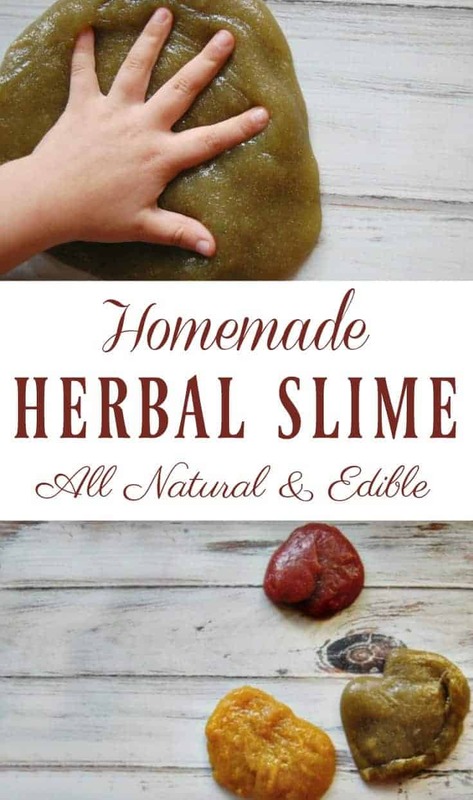 Many homemade slime recipes use glue and borax. Now white glue isn’t the worst of stuff (although the brands aren’t required to disclose ingredients so we don’t know that for sure. Most assume that white glue is made for polyvinyl acetate which doesn’t have the worst concerns. The MSDS sheet lists mostly possible irritations. Borax on the other hand has always been iffy. You’ll find half the natural living world say it’s ok and the other half says no way. (I tend to lean toward the no way camp). The MSDS for borax lists decent concerns with regards to eye contact and ingestion (we all know not to eat borax, right? But kids don’t know that…) Those concerns alone give me enough reason to not bother with borax. So like I said, I didn’t bother making my own slime for years. Then I discovered that you can make your own slime with just once ingredient and it is 100% safe (in fact it’s 100% edible! Not that I’d want to eat it, it’s not exactly yummy). What’s that ingredient? Psyllium husk powder! Psyllium husk powder is the main ingredient in Metamucil as it is packed with fiber. It’s made from seeds. No weird chemicals. (well no weird ingredients unless you use Metamucil which does have a few random ingredients like dyes). Now I didn’t want plain slime (or due to the psyllium husk powder it’d more likely be brownish slime). Kids want color! I could have turned to natural dyes (and you are more then welcome to!) but I hate wasting those. Instead, I used herbal powders. 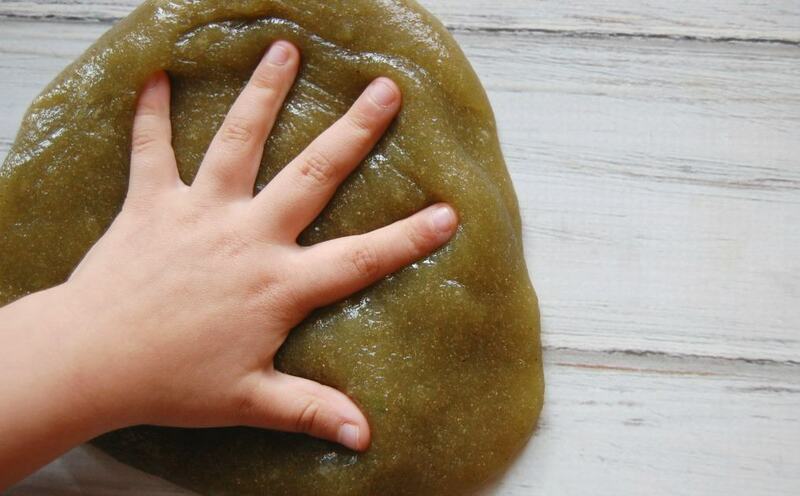 I’ve used herbs in many of my kid crafts like my homemade play dough, herbal moon sand, and my herbal window clings and let me tell you, homemade herbal slime works great. It is harder to create all the colors but I was able to create red (beet powder), yellow (turmeric), and green (matcha) easily! 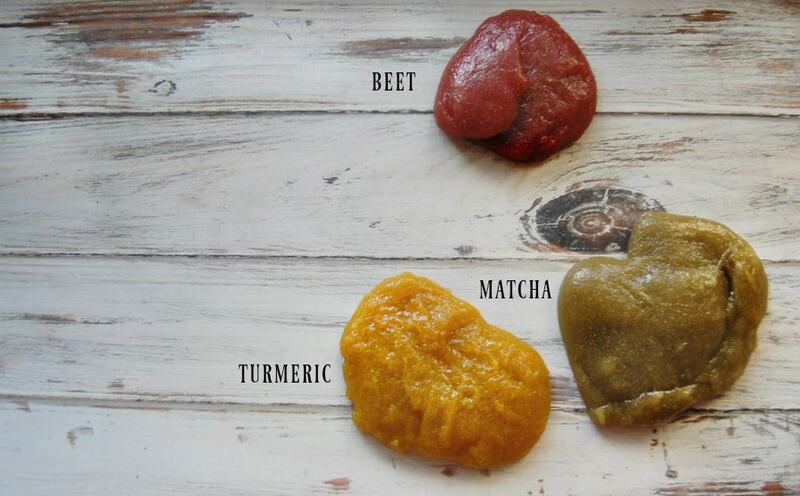 If you find more herbal powders in other colors that work well, let me know! Cook until it boils. Once it boils it will only take about a minute before it’s done. When it just starts to look like slime, it’s done. If you want slimier, wetter slime cook it for less time. If you want mess free slime cook until it pulls away (in a slime-y fashion) from the pan. Store in an air tight container and it should last awhile. If your slime starts going crumbly (not dry crumbs but like how gelatin can break into tiny pieces), I’ve found that heating it back up for a bit will bring it back together. Looking for more non-toxic homemade crafts? I freaking LOVE that all the color options are comeplely natural! If I were to make slime this is definitely the way I’d go!